Over the past few months, we’ve been putting a bunch of different high-powered LED bike lights through the grinder as part of our Combo Light Group Test. By ‘combo’, we mean ‘combination’, which involves pairing a handlebar light together with a helmet light. We test a lot of different lights here at Singletrack Towers. If you need any proof, check out the Light Review section on our website. We’ve ridden with super high-powered multi-LED monsters, trick German-made lights with all sorts of clever electronic wizardry, and we’ve tested our fair share of cheap ‘n’ cheerful Chinese lights too. 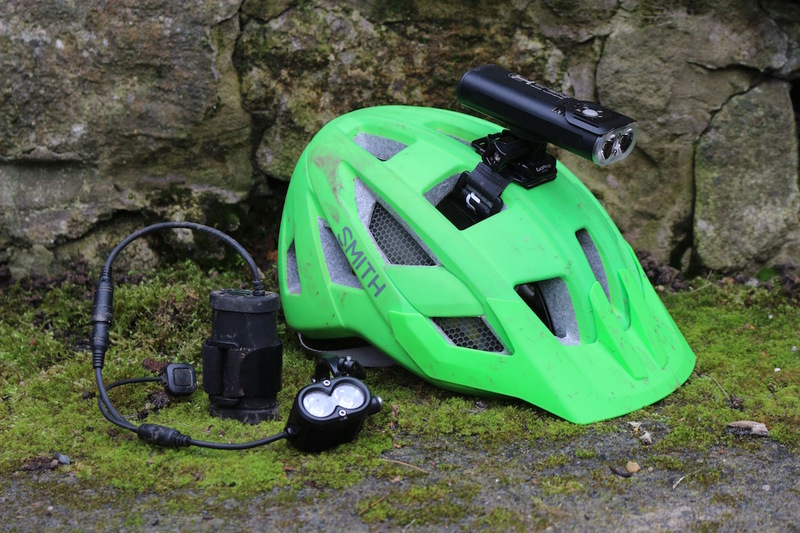 We’ve tested hub-powered dynamo lights, lights with wireless remotes, and even a light that features an in-built camera. To say that we get out for our fair share of night riding is an understatement. But then, night riding is kind of a necessity in winter right? When you leave for work in the morning and it’s pitch black, only to return home at the end of the day when it’s also pitch black, it doesn’t really leave a whole lot of time to get out onto the trails without electric-assistance. Eight high-powered LED mountain bike lights designed for blazing the trail while under the stars. That said, night riding is far too much fun to be restricted to winter. We do just as much night riding in spring and autumn as we do over the coldest months, while in summer, using lights is the ticket to late-night bikepacking trips under the stars. On home trails, night riding is a superb way to reinvigorate those boring rides that you know by the back of your hand, and it also opens up the doors to partaking in all sorts of wonderful mountain bike races, events and social rides that would be impossible without lights. 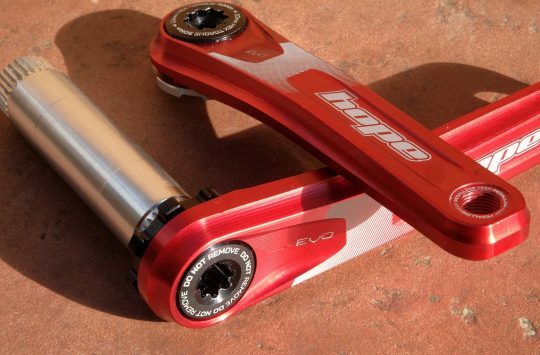 When you think about it, what other component or accessory is capable of opening up so many more riding opportunities? Carbon wheels and fancy drivetrains are nice and all, but if you actually want to ride more, if you actually want to increase the amount of available hours in the day that you could be out exploring on two wheels, then you could do far worse than get your hands on a good quality lightset. 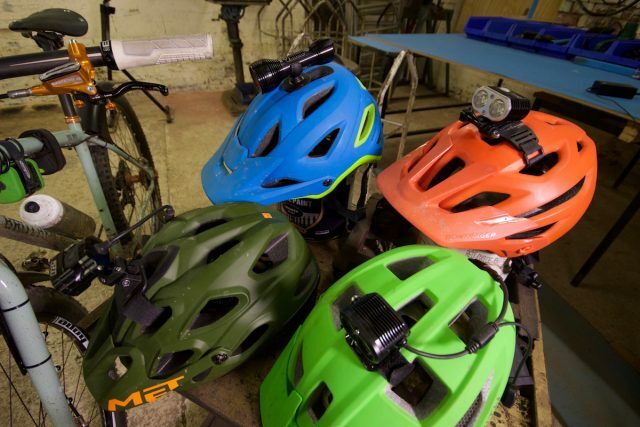 A helmet-mounted light offers the ability to direct the light where you’re looking. If you’ve never partaken in night riding, then you must get out there and give it a go. It’s an absolute hoot, and an experience that is unmatched by daytime riding. If you’re just dipping your toes in the water, then a helmet-mounted light is the best place to start. A helmet light is ideal for being able to direct light on the trail as you need, which is particularly useful for tight and twisty singletrack. As such, a good helmet light should be nice and bright with a fairly concentrated beam pattern. It also can’t be too heavy, as your neck will have to support whatever extra weight you’re carrying. 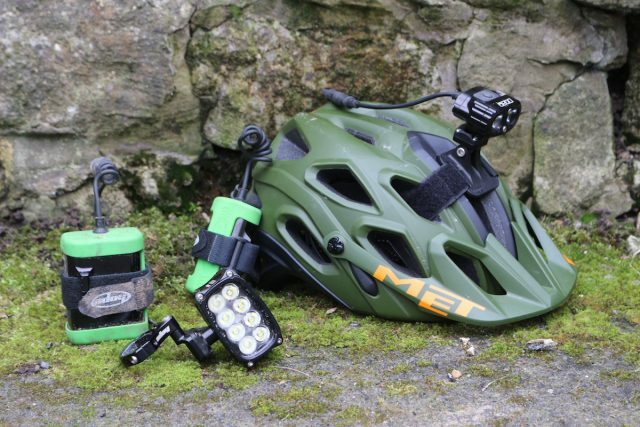 However, because of the higher beam angle, a helmet light isn’t particularly good at providing shadow definition behind rocks, roots and obstacles on the trail. The result is that all of those obstacles look a lot flatter and shallower than they actually are. This is where a handlebar-mounted light comes in. 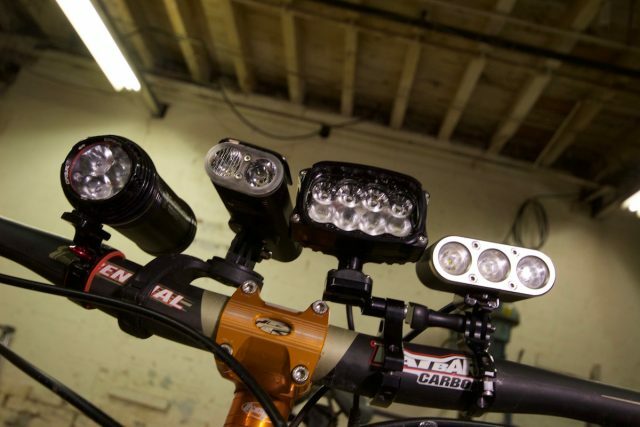 While a powerful handlebar light can deliver a broader beam pattern and increased shadow definition of trail obstacles. While a handlebar light will only cast a beam where your handlebars are pointing, it’s position lower to the ground helps to cast a deeper shadow behind trail clutter to help you pick out those obstacles before they’re under your front wheel. And the faster you attack the trail, the more important this characteristic becomes. For a handlebar light, getting something that has a nice and wide beam pattern is also good for boosting your peripheral vision and lighting up a broader surface area around you. Weight is less of an issue, so bigger head units with more LEDs can be used to help cast a bigger flood of light on the trail, while larger battery packs can be strapped to the frame to help power those LEDs for longer. With all of that in mind, we’ve been testing several of the latest combination lightsets from four different brands. There are lights from Exposure, Gloworm, Hope & ITUO, with us having selected a handlebar and helmet mounted light from each brand. Covering a variety of design styles and price points, we wanted to see what kind of performance is on offer from some of the newest lights to hit the market in the past 12 months. As part of the testing process, we took each light out onto the trail to shoot photos of the actual beam pattern, using identical camera settings in order to accurately show the difference between the output of each light. We also shot loads of on-trail video, and you’ll be able to check those videos out in each of the separate reviews available to read online right now. In order to test each of the manufacturers claims to battery life, we also setup a burn time simulation that you can check out in the video at the bottom of the page. It’s pretty dull, though we can assure you it was far duller actually monitoring the test. However, it was still an interesting exercise to determine what lights lived up to their claimed burn times, and which lights either exceeded or came up short on the claims. But enough of that boring and nerdy test stuff – how did the lights actually go? And which did we think were the bees knees? Check out all the lights we tested in the list below, and follow the links to read all of the reviews. 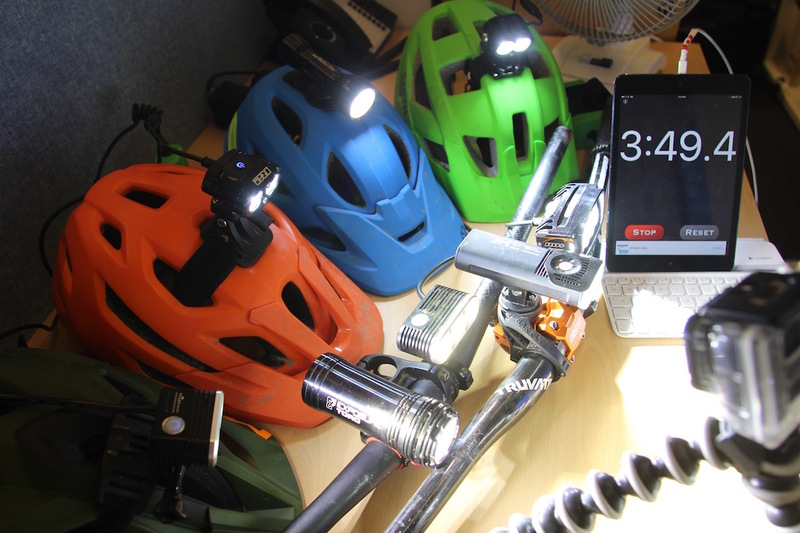 From Exposure Lights, there’s the Diablo (helmet) and Toro (handlebar). “When it came time to decide on what lighting brands we’d be including in our four-way Combo Lights Group Test, there was one brand that was a non-negotiable: Exposure Lights. Coming under the USE umbrella, Exposure Lights is a British-based lighting brand that manufactures high powered riding lights down in West Sussex. Read the full review of the Exposure Diablo & Toro Lights here. From Gloworm Lights, there’s the CX Trail (helmet) and the X2 (handlebar). Based out of Auckland in New Zealand, Gloworm Lights has been around since 2010. In that relatively short space of time, the once small brand has promptly established itself as a genuine global player, with distributors located all over the world including in the US, Italy, Germany and the Netherlands. 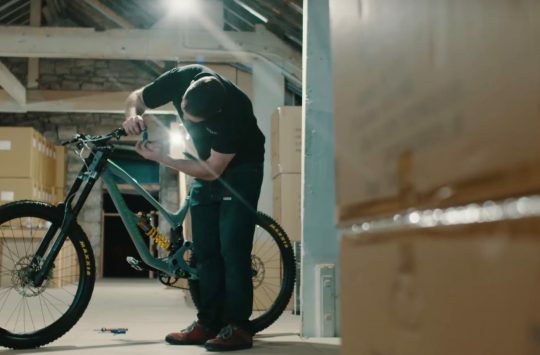 Ison Distribution sells and supports Gloworm Lights in the UK through a broad network of bike stores, and that means things like spare batteries and mount kits are never too far away. 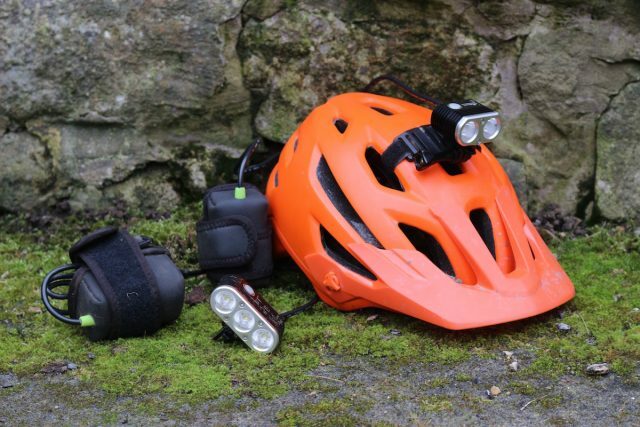 Read the full review of the Gloworm CX Trail & X2 Lights here. 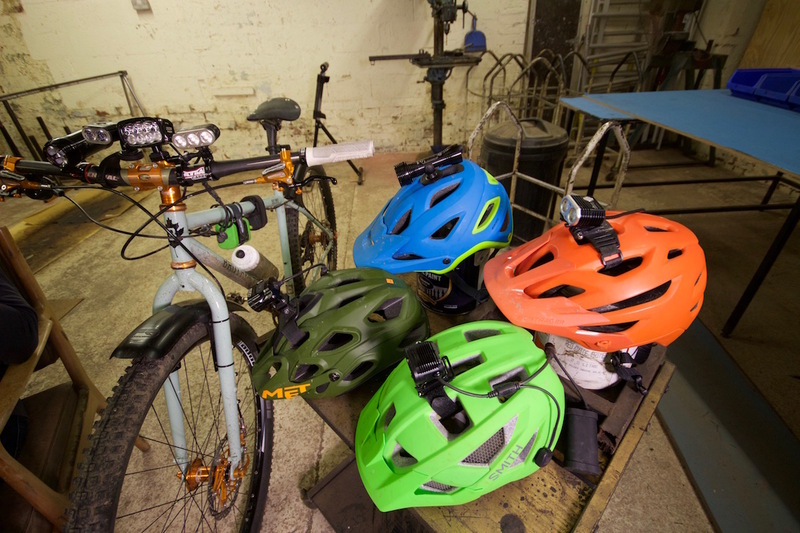 We chose an R2 (helmet) and an R8+ (handlebar) from Hope Technology. “Hope Technology may be best known for its whirring Pro4 hubs and trick anodized hydraulic disc brakes, but the UK based manufacturer also makes a banging range of high-powered LED bike lights too. Employing some of that classic Hope machining wizardry, Hope lights feature a tough alloy construction for the light bodies and battery packs, along with high-powered Cree LED’s and rechargeable lithium ion battery cells. Careful consideration has been placed on ensuring the lights are watertight and built to last. Read the full review of the Hope R2 & R8+ Lights here. And from ITUO, there’s the XP2 (helmet) and the XP3 (handlebar) lights. “ITUO lights aren’t a hugely well known name in the off-road lighting scene, but the Chinese company has been spreading its wings in recent years thanks to a wide range of user-generated input and global distribution channels across the US, Canada and Australia. 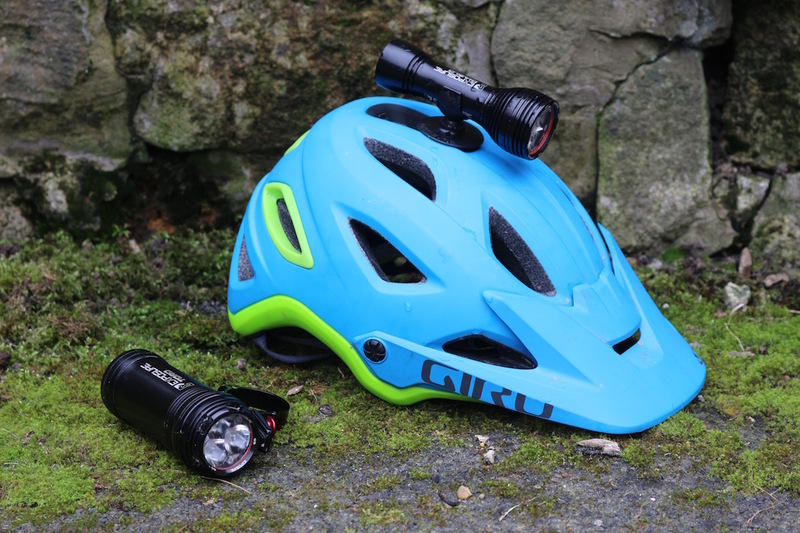 In the UK, ITUO is distributed by Bright Bike Lights, which handles backup service and warranty support – reassuring compared to buying off an unknown eBay seller. Read the full review of the ITUO XP2 & XP3 Lights here. 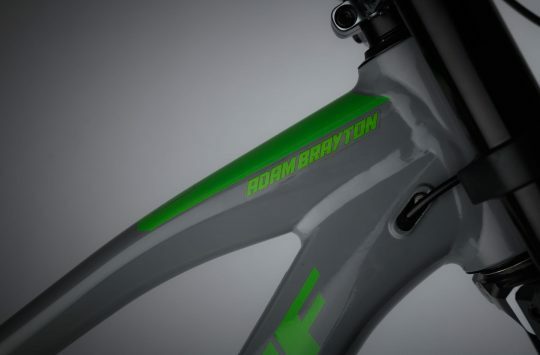 Nukeproof’s new DH bike finally named. Meet the Nukeproof Dissent! Good yeast but would have been handy 5 months ago at the start of the night time riding season.